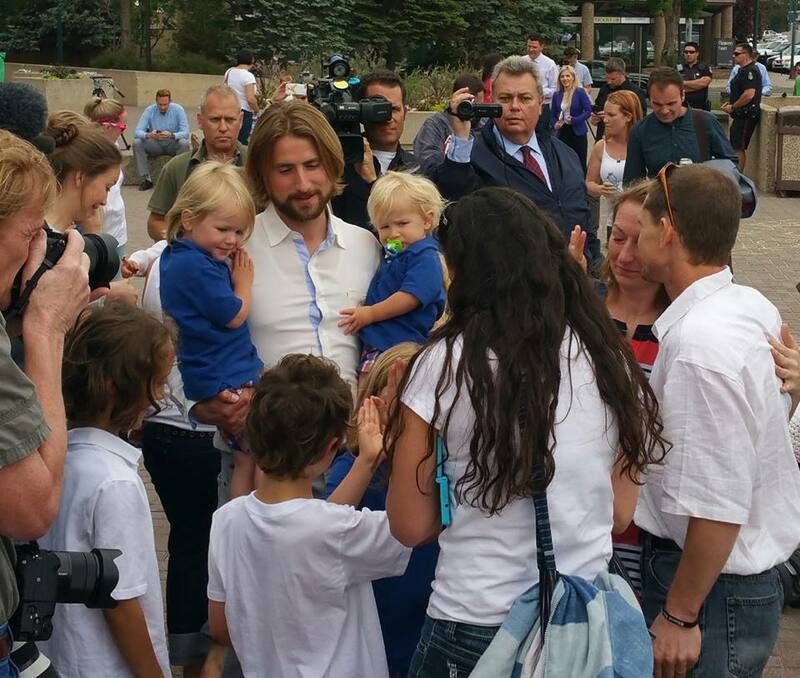 David and Collet Stephan of Alberta, Canada, were sentenced after the widely-publicized death of their son Ezekiel and subsequent court trial. Some supporters of the family openly wept when David was sentenced to 4 months in prison, but many of those same reporters were relieved that Collet will not be imprisoned, but will be under 3 months of house arrest. The sentiment is that, "At least she will get to be with her children." After a back and forth bout with the croup and flu-like symptoms in 2012, court testimony showed that the 18 month old little boy seemed to bounce back before suddenly taking a turn for the worse. As Health Impact News has previously reported, there was a great deal of expert testimony and evidence presented that demonstrated that the child would most likely be alive today were it not for serious failures on the part of the medical system. Because of the negative press, theirs is a high profile case. David is in solitary confinement and told his wife that he didn't see the sun for 5 days. The rumors and twisting of the facts in the media have endangered David's life, Collet told Health Impact News. Her husband is in solitary confinement out of fear for his safety after the media has painted him as a monster instead of the kind, loving father that he is. Who decides what these ‘necessaries’ are? Is the Canadian government going to list it all out for us in point form? You know, just so we citizens can be sure we’ve got it right? Everything about this case smells off. This was a brilliant orchestration from beginning to end. It took the Crown 4 years to craft it. Over time the Stephan case will be recognized for what it really is; the corporate tier’s first warning shot across the bow for every parent in the nation. Clever move! The Japanese have a saying ‘Business is War’. Our ‘natural lifestyle’ loving neighbours south of our border are fighting a war tooth and nail right now, against Pharmaceutical Goliaths who want informed consent out of play. Children are marked for a clear path to ‘veins’ of profit. The battle is overt and clear - citizens vs a Medical Police State. The corporate agenda is not different in Canada, but our art of deception style is a little more British. The legal precedent in the Stephan judgement is so open ended and subject to interpretation that it’s only value is to gaslight every family in the nation. People are being warned… you can do it your way but if anything goes wrong, you will be held criminally liable, even if there are factors outside of your control. I think that the Stephan’ are good people. They probably are great parents. They are probably more capable of looking after their children’s health issues than most people. Is it possible that this illness snuck up on them? I would say yes. I believe them. I had a really hard go with my child’s health, so I know how fast a child’s illness can go from moderate to freak-out. It is scary business this parent stuff. Back in the day I was told by an emergency department attendant, that I was over-reacting, wasting their time and costing the system money by bringing my child into the ER for every little thing. The every little thing at that point was that my child had been crying for over 10 hours straight after receiving the recommended vaccines. Then I took her home and she cried for another 7 hours. This family was cherry picked to warn the rest of us that Big Brother is watching. Take your drugs, get your vaccines, drug-up from the womb to the grave and follow the herd. The sentence David and Collet received is harsh enough for us to get the point but not so severe we would be rising to the injustice. Clever move! So far most Canadians are still asleep. There is another case coming up, now that this precedent has opened the door. The freedom to choose our healing path may be what is on trial. My heart goes out to David, Collet, their boys, David's dad, stepmom, brothers and sisters, a great injustice has been done, an innocent dad is in prison, in danger of his life, I pray with all my heart that the guards will do what they are supposed to, and guard him from the evil people who are threatening him and his family. I have had my eyes opened through all this, I'm realizing that people have their minds set to what they want to believe, we can not make them read the evidence of the coverup and corruption, so instead I'll pray the them and forgive them for they know not what they do! When I have been around David, I have felt nothing but a spirit of love and peace and compassion, and let's hope and pray it will all turn out well for them. But out of the tens of thousands of deaths due to vaccinations, not a single person, parent or doctor, has ever even been charged..... what a psy-op. Collet - I am deeply sorry for the loss of your son. And I am sorry for the other losses you, husband and family are going through from this ordeal. But as we moms of children who have died know, there is no deeper pain, no deeper grief than the loss of a child. To compound that with what is happening to you is beyond horrendous and my heart truly breaks for you. Know that even in the midst of such a battle you are being put through that you DO have the strength within you to go on and to continue to fight for justice for you and your family, and justice for your precious son's legacy.. These people not only obliterate our lives but they change our child's legacy in doing what they do. It is up to us moms (and dads) to fight them in order to seal our child's "true" legacy and never allow any falsehoods to desecrate what is sacred. My 14 year old daughter was taken from me at the hospital she was receiving her chemo for cancer when a student in the psychiatry program there - who we had never met before - threatened me that if I did not allow her to put my daughter on two psych drugs immediately that she will "go to a judge and get it done that way." When I insisted on consulting daughter's medical team she went ahead and called DCF and alleged I was preventing my daughter from getting critical medical and psychiatric care - even though daughter had just had her 4th round of chemo and we were at Mayo,wld renown hospital at the time. My name went immediately onto the child abuse registry, I was never charged with a crime, a judge ordered daughter remain where she had been taken to away from her medical treatments and stem cell transplant that was to have taken place just 21 days later. She of course died in the process and in keeping her from her transplant. I did get my name off the registry after representing myself on appeal with my state's attorney general and all evidence proved I did just the opposite of what was aleged against me and that the psych student had also falsified my daughter's records. Sadly and unbelievably, the student did graduate and is now a licensed child psychiatrist in practice as well as in a teaching capacity at a state university, showing stellar references on her bio on the university website. At the time she did this to my daughter she was doing a research paper for her class on eating disorders in teen girls and the use of psych drugs to correct such behavior disorder. This too is listed on her bio which makes it even more evident what she purposely did to my daughter and family in order for her own self serving gains.. Cancer patients have a hard time with appetite and will often become underweight, which would fit this students research paper profile as my daughter was teen aged and did not have an appetite and was a tad underweight. I am praying for you and your dear husband and your family. Stand strong. God IS with you. I'm totally anti-vaccine! No evidence exists to show vaccines actually work. Majority of the studies are conducted by the vaccine manufactures. Universities are paid off by the manufacturers to deliver false studies that paint vaccines in a positive light. They want everyone on vaccines as part of a eugenics program admitted by top elites such as Bill Gates. Healthy People 2020 highlights force inoculations for all adults and two prescription drugs mandated to every human on the planet. Look it up! God created our immune system. If vaccines really enhance our immune system, then wouldn't that make man more powerful than God? Man is mortal and not as powerful as God. Therefore, vaccines are a deception which act to destroy God's creation. Case closed. A truly horrendous ordeal for a lovely family - Canada is a sick nation to be able to torture a family like this . What happens to hospitals that kill or maim kids with vaccinations - Nothing ! Yet forced vaccination would not have helped this child . Vaccine corporations must be loving this power - they can make billions out of this subtle force which is not even law. So this father is in jail for a law which does not exist. Canada's legal system must be corrupt. This is a tragedy & I am so sorry for this little family. While i am not a religious 'nut' or an anti- vaccine 'nut' either, I do think we are seeing a terrible precedent here for trying to CONTROL everybody - and it is the Big Corporations that are pushing for this - the vaccine industry & all Big Business has way too much power & is gradually pushing for their own control over the people. Look what happened with Ebola/Sars/, even HIV is suspect, and now Zika - they look for the next thing to use as a pretext to grab public billions to make the next 'vaccine' to 'protect' the population, get everybody all hysterical, and cause the health overseers in government to take over & 'do their thing' - the facts about vaccines are not what they tell us - Diphtheria for instance had almost diisappeared at the point they started vaccinating kids - and now they do 32 different 'shots' to protect kids from 'diseases' they possibly could get, but probably would not. It is BIG BUSINESS for the drug companies, based on convincing government,who do not know any better, that there is a problem. Zika virus has been around for many years causing no issues, and is not the cause of microcephalic babies in Brazil - where they just happened to have severely sprayed the whole area of occurrence with chemicals just prior to the birth of all these afflicted babies - whoah - lying going on & cover-ups by Big Chemical - of course - the Capitalists earning billions from their products are NEVER going to admit to anything if they can convince the public of their innocence. Wake up people - we are stooges to Big Corporative power !